Java Sending Email, JavaMail API is not part of standard JDK, the developer will have to install it from the web site and include it in build path, jar file needs to be imported that is Java.mail.jar. Following is an example to send the documents from one to another. Java Sending Email, The process for sending mail with attachment involves a session object, MineBody, MultiPart objects. Here the mind-body is used to set the text message and it is carried by MultiPart object. Let us see the example for the concept Java Sending Email like how to send email with attachments. Recipient’s email ID needs to be mentioned. Set the properties to the SMTP server as follows. Java Sending Email, When compile the program following is the output will be displayed in the console. Open the mail and find the attachment. By making use of MineBodyPart, BodyPart classes from JavaMail API sending electronic mail with attachment is possible. The process for sending mail with attachment involves session object, MineBody, MultiPart objects. 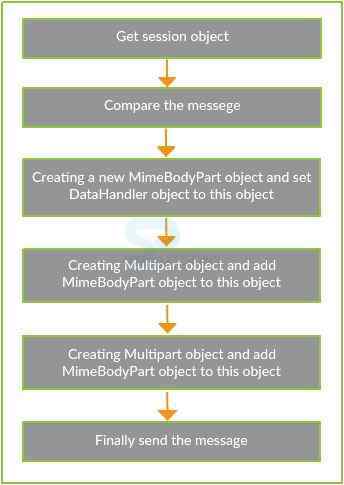 Here the MineBody is used to set the text message and it is carried by MultiPart object.